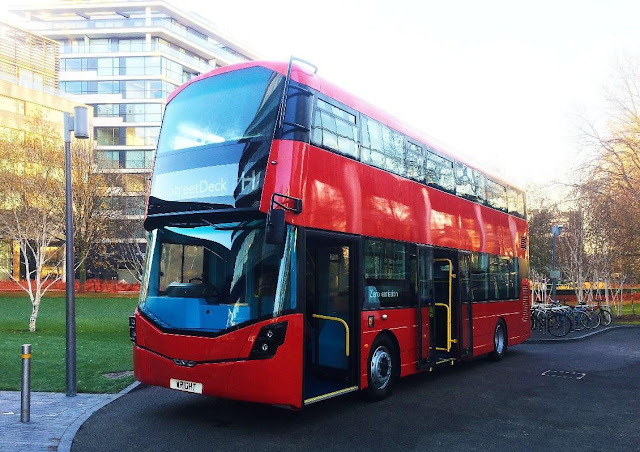 London’s City Hall was the venue for the launch yesterday (30 November 2016) of the new Wrightbus – zero-emission double deck bus. The zero-emission vehicle debuts a new hydrogen fuel cell driveline from Wrightbus which will rapidly become available to power both single deck and double deck buses as it becomes fully production ready next year. The new technology from the Northern Ireland company provides a zero-emission drive system which encompasses a hydrogen fuel cell and a battery pack to power the vehicle. The combination of these two technologies makes the continuous daily operation of the public transport vehicle feasible. Offering a reliable system with no emissions, all Wrightbus hydrogen fuel cell vehicles will feature an electric drive axle packaged to allow a full flat floor throughout the bus, a zero-emission heating/cooling system, the ability for overnight charging if the operator desires, and remote diagnostics. Key to the success of this concept are the lightweight hydrogen storage tanks, and the automatic battery management system which continuously monitors and balances the stored power while the vehicle is in service. The project has been part funded by the APC under a grant for common platforms and assembly methods for Ultra Low Emission Buses.